You don't want to wait to long for the test results, to see if your HDD properly works! AND: Too many tests may reduce the lifetime of HDDs, SSDs and other Drives. Especially SSD, SD and other memory-storage based Drives. In general, even the quick test of IsMyHdOK (about 15 seconds) is also quite meaningful. Of course, the long test, which lasts about 4 minutes, is more accurate. But you do not always want to be hair-splitting, just want to know if everything is alright! (Image-1) Variable time for Benschmark! It should be noted that some anti-vicious programs that run in the background and are quite aggressive can falsify the test result. Here you can definitely consider replacing it with another one, or check whether your Windows computers are not protected multiple times by various anti-malware software! For example, if you turn off the antivirus program for a short time, the IsMyHdOK values ​​will be a lot better, or even better. With the SSDs or HDs, the manufacturer's data about the data transfer rates maximum values for writing and reading can be achieved. 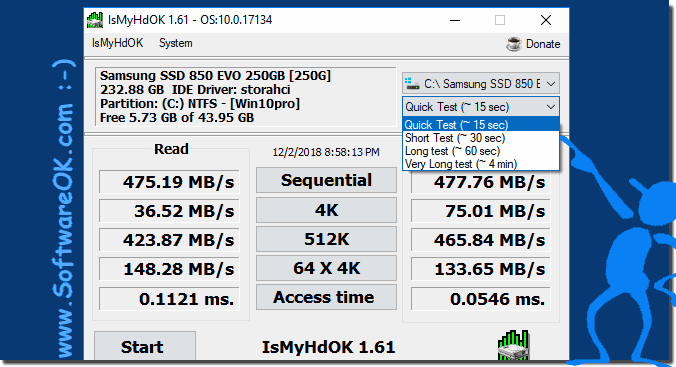 IsMyHdOK measures the actual data transfer rates that can be achieved in everyday use, depending on the application and the amount of data on the hard disk, these may differ significantly. IsMyHdOK - FAQ-3: For what four different duration of Benschmarks?